Volleyball is played by two teams of six players on a court, separated by a net. The object is to score points by sending a ball over the net to ground it on the other team’s court, and prevent the same effort by the opposing team. As players can’t catch or hold the ball, volleyball is a rebound sport, and a fast game of constant motion. The receiver of an attack must assess incoming angle, decide where to pass the ball and control their pass in the blink of an eye. The ball is usually played with hands or forearms, but players can legally strike the ball with any part of the body. Numerous player formations and techniques and tactical team movement may be employed, determined by the teams’ chosen serving, offensive and defensive systems. Players must be able to make quick direction changes, as well as being able to start and stop instantly. Powerful legs produce height in vertical jumping as well as lateral speed. Demand is placed on muscles and joints due to the unpredictable nature of the game, as well as impact from spiked balls travelling at great speed. Strength and suppleness are critical in stabilising the body and preventing injury. For the upper body, players need strong rotator cuff muscles for serving and spiking, pectorals and triceps for setting, and latissimus dorsi for setting. Powerful, flexible lower body muscles are also employed. Skills include hand/eye co-ordination, flexibility, accuracy, core strength and balance, speed and endurance. A player throws the ball in the air from behind the back boundary line and hits it with their hand, so it passes over the net and ideally lands inside the receiving team’s court. Balls may be served underhand or overhand, but underhand serves are rarely employed in high-level competitions. 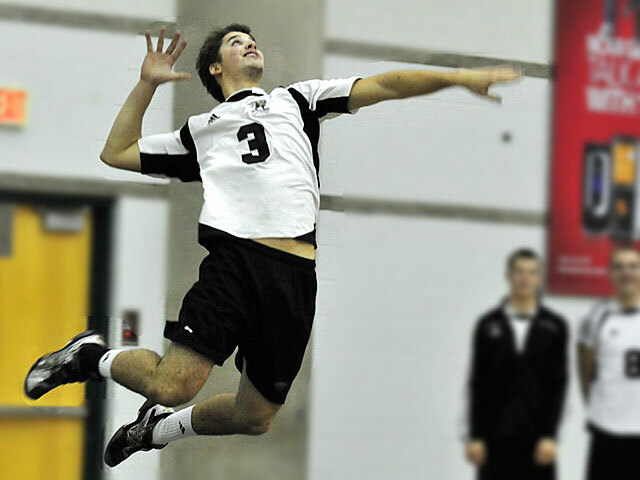 Servers may make an overhand ‘jump serve’; where the ball is tossed high in the air, then the player jumps to make contact. – The ‘topspin’, where the ball spins hastily without changing its course. The velocity makes it hard for opponents to counter-attack the hit. The Dig: An underarm pass made with the forearms, in response to the opponent’s serve, spike, or any attack, preventing the ball from touching one’s court, particularly a ball that is nearly touching the ground, and redirecting the ball’s trajectory towards the ‘setter’. A player may perform a ‘dive’, throwing his / her body in the air with a forward movement in an attempt to save the ball, landing on his / her chest. The Set: An overhead pass made with the hands, putting the ball high in the air, usually on the second of the team’s three permitted touches, so the ball’s trajectory is aimed towards one of the players designated as an attacker, so they can spike it. The setter’s main responsibility is to place the ball in the air where attackers can hit the ball into the opponents’ court for a point. The Spike: An overhead attacking shot, to smash the ball ‘over arm’ downwards into the opponent’s court. Usually the third contact with the ball: the attacker jumps, raising one arm above the head and hitting the ball so it returns over the net and moves quickly down to the ground. 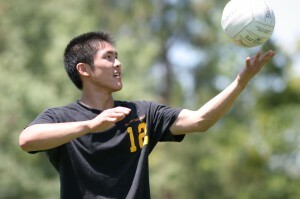 A player makes a series of steps (the ‘approach’), jumps, and swings at the ball, using arm swing, wrist snap, and forward contraction of the body to drive the ball. There are numerous attacking strategies / techniques possible, designed to confuse and surprise the opposing team’s defence, and take advantage of areas on court not covered by the defending team. The Block: This may be utilised to preventing an attacking ball from coming over the net by forming a ‘wall’ of hands at the net. Players at the net jump and reach above the net to block the ball. If the ball is hit above or through the block, defensive players in the rest of the court attempt to prevent the ball reaching the ground with a ‘dig’. Only players at the net positions can jump and spike or block near the net. Breaks up adhesions caused by micro-scarring through ‘stuck’ muscle fibres. Loosens bound fascia and alleviates trigger points within muscles, which affect the function of muscle groups when racing and training. Encourages flow of lymph, helping waste be drained away. Reduces pain by stimulating endorphins. Poor technique or overuse in overhead techniques such as the serve, spike and block may damage the shoulder rotator cuff muscles or tendons, contributing to tendonitis, muscle tears or impingement injuries affecting the rotator cuff or biceps tendons. A serve requires substantial force from the shoulder complex, coupled with maximal lumbar extension. A strong trunk is required to allow the torso to come forward, and the explosion of energy requires strength and flexibility. Massage can help release and lengthen soft tissues. The four rotator cuff muscles control rotation of the shoulder, and are put under a great deal of strain in sports with overhead ‘smash’ movements. Tendonitis implies sudden inflammation of the tendon, whereas a tendinopathy is more gradual degeneration of the rotator cuff tendons. Supraspinatus and infraspinatus are the most commonly affected muscles. A sudden sharp pain in the shoulder indicates a possible tendon rupture. A degenerative, overuse injury caused by repetitive movements. Poor posture contributes, because a rounded forward-shoulder position reduces space in the joint through which the tendons pass, leading to tendons rubbing on the underside of the acromion process at the top of the shoulder joint. Repeated friction leads to pain and degeneration. Poor sporting technique and body use mean the joint and muscles are put under stress, and thickening of the tendon can lead to an impingement syndrome. Pain in shoulder when rotating the arm, especially against resistance. A ‘painful arc’ on abduction (raising the arm out to the side) is present if supraspinatus is involved. Tenderness when pressing on affected tendon, which may also feel thickened. Rest from activities which cause pain. Apply ice in the acute phase to reduce pain and inflammation. See a sports injury specialist who can diagnose the injury and advise on treatment and rehabilitation. Techniques to reduce pain and inflammation may include anti-inflammatory medication or treatments such as ultrasound and laser. Rehabilitation program to strengthen associated muscles and correct muscle imbalances. Sports massage will help relax tight muscles in the shoulder in general. If the injury is chronic, cross friction massage may be applied to the tendon itself. This can help break down adhesions between the tendon and sheath surrounding it, and encourage correct healing. In impingement cases, tight and overworked muscles can be palpated along with others that are not stabilising the shoulder. Improved counterbalance between the rotator cuff muscles, lengthening of short, tight muscles and engagement of weak muscles using muscle energy technique can be achieved. Advice on how to prevent the injury recurring, identifying strategies to give the client ownership. This may include identification of poor technique in sport or work-related repetitive overuse (for example deskwork), so muscle imbalances can be corrected with exercises, stretching and workspace evaluation. Damage to fingers, hands and wrists is common due to the ball being served and spiked at such speed that blocking attempts can lead to injury. Sprained ligaments in the fingers, hands and wrist are most common, followed by fractures. The metacarpophalangeal joint of the thumb is the most commonly injured ligament in the hand (thumb sprain), along with finger sprains. Strains to muscles or tendons are also possible. Thumbs can be bent backwards in contact sports causing damage to ligaments at the base of the thumb, resulting in joint pain. ‘Trigger thumb’ occurs when the thumb gets stuck in a bent position, due to gradual thickening of an inflamed tendon. ‘Trigger finger’ similarly occurs when tendons in the finger become inflamed and thickened, preventing them from moving properly, so they contract, sometimes causing the finger to snap in a bent position. ‘Mallet finger’ occurs when the client is unable to straighten the finger tip without assistance. Sudden onset wrist pain is usually caused by falling or twisting onto an outstretched arm. Wrist injuries can range from a mild wrist sprain or wrist strain to a severe broken wrist. Falling on an outstretched hand could cause a fracture to the radius bone on the forearm, or of the scaphoid, a tiny bone in the wrist. Gradual onset wrist pain could be caused by overuse or a repetitive strain injury (RSI), which involves inflammation or degeneration of the tendons in the wrist. This could be triggered by carpal tunnel syndrome or wrist tendonitis; inflammation or degeneration of the tendons in the wrist. Heat, redness, swelling and pain are symptoms of inflammation linked to ligament sprains which present very quickly after injury. Symptoms of carpal tunnel syndrome include a dull ache in the wrist and forearm, with pain which may radiate into the hand and fingers. The pain is often worse at night. Immediate first aid should be undertaken and if a fracture is suspected, seek medical attention immediately. Sprained fingers respond well to rest (avoiding the sport for a couple of weeks), and a ‘buddy’ finger taping technique which protects the area. RICE (rest, ice, compression and elevation) in the acute stage is helpful. Wrist and hand rehab exercises as part of a rehabilitation and strengthening programme. Once in a sub-acute stage, soft tissue management can help aid the healing process. This is a common overuse injury in sports that demand frequent jumping, resulting in pain just below the bottom of the kneecap (patella), in the quadriceps tendon which attaches the patella to the shin bone (tibia). It is also referred to as a tendinopathy as no inflammation (heat, redness, swelling) is present. This tendon is extremely strong and allows the quadriceps muscle group to extend the knee and straighten the leg in jumping to propel the individual off the ground, as well as stabilising their landing. As such, this tendon comes under a large amount of stress, especially in individuals who put extra strain on the knee joint by performing sports involving direction changing and jumping movements. With repeated strain, micro-tears as well as collagen degeneration may occur. Under extreme stresses such as those involved in constant jumping, a partial rupture can occur. This can lead to inflammation and degeneration of the tissue. It is usually an overuse injury due to repeated eccentric quadriceps contractions, as occur when landing from a jump. This condition may be associated with poor vastus medialis (medial quadriceps) function. Calf weakness may also be present. Pain when pressing in at the bottom of the kneecap, aching and stiffness after training and pain when the quadriceps muscles are contracted, ie when jumping. The affected tendon may appear larger than the unaffected side. Substantial period of rest and a thorough treatment and rehabilitation programme. Jumpers knee can be categorised into four grades of injury, depending whether pain is present during everyday activities or during or after training. Many athletes continue to train and compete on what seems just a niggling injury. However, if left to become chronic, it can be difficult to treat and may require surgery. In mild to moderate cases, rest from sport then adaptation of training methods to reduce impact and jumping activities may be sufficient. Eccentric strengthening of the quadricpes is usually recommended. Apply ice packs after exercise, to reduce inflammation. Wear a knee support to ease strain on the tendon. Anti-inflammatory medication ie ibuprofen can help. Cross friction massage techniques across the tendon. Massage of the quadriceps and general massage of other weight-bearing power muscles of the legs, including the posterior calves, to reduce ‘pull’ on tendons and decrease the loading on the patellar tendon. Achilles tendinitis causes pain along the back of the calf near the heel. Whereas tendinitis implies a sudden rupture or inflammation, tendinopathy refers to gradual degeneration. The Achilles connects the posterior calf muscles to the heel bone (calcaneum), providing power in the push off phase. Huge forces are transmitted through the Achilles when running and jumping. Although it can withstand great stresses, it is prone to overuse and degeneration, resulting in pain, inflammation and thickening. Healing is slow, due to its poor blood supply. A tendon injury may be acute (sudden and painful) or chronic (appearing gradually and niggling away). Overuse, or increase in distance or speed. Running up hills, as tendon has to stretch more than normal. Change of footwear or training surface, causing heel to drop lower, stretching tendon further than usual. Weak or very tight calf muscles, increasing strain or ‘pull’ on tendon. Overpronation of feet: as foot rolls in, lower leg rotates inwards, which places twisting stresses on tendon. Wearing high heels shortens the tendon and calf muscles. When exercising in flat shoes, tendon is then stretched beyond normal range which places abnormal strain. Gradual onset of pain at the back of the ankle, just above heel bone. Pain at the start of exercise which fades as exercise progresses and the tendon and posterior calf muscles get warmed up. The pain may later return if the training session is prolonged. Pain eases with rest but is worse in morning; client may ‘hobble like old man’ on getting out of bed. Tenderness on pressing the Achilles tendon or squeezing it from the sides. Gradual onset of pain over weeks, or even months. Pain during exercise and constant throughout. Pain when walking up hill or up stairs, because Achilles is having to stretch further than normal. Stiffness especially in the morning or after rest. Nodules or lumps in tendon. Tenderness on palpation or pressing on the Achilles tendon, as well as swelling or thickening. Creaking sensation (crepitus) may be felt when fingers press the sides of the tendon. Rest and apply cold therapy to reduce pain and inflammation. Gradual return to activity. Heel pad to raise heel and take strain off Achilles. Taping to support / protect while returning to fitness. Correct training shoes for foot type and sport, with appropriate roll control and support. In later stages apply heat before exercise. Tendons perform better when warm. Cold after training to reduce inflammation. Massage of the feet and lower limbs to reduce tension and stretch the calf muscles, help to reduce swelling, aid circulation and prevent the build up of adhesions and scar tissue in the tendon. Frictioning techniques as well as classic massage of the lower limb, especially the posterior calf muscles is helpful. The most common type of ankle injury is a sprain; a stretching and tearing of ligaments. The foot may roll inwards or outwards. Ligaments join bone to bone, and are very strong, designed to stabilise, not stretch. As ligaments have a poor blood supply, if the joint is ‘turned’ and forced over, they don’t spring back well and become lax and the injury tends to happen over and over on the same limb. Ankle sprains are graded depending on severity, pain level and instability. With a mild sprain the athlete will able to continue with training or competition. A very severe injury will result in hospital treatment. An inversion sprain or lateral ligament sprain is where the ankle turns over so the sole of the foot faces inwards, damaging ligaments and other soft tissues on the outside of the ankle. An eversion ankle sprain happens when the ankle rolls the other way. In addition to ligament damage there may also be damage to tendons, bone and other joint tissues. Twisting or turning of the ankle. Pain will be felt in the ankle joint itself although specifically when pressing in on damaged ligaments. Swelling or bruising may be present but not always in milder cases. Heat, redness, swelling and pain, possibly unable to bear weight. Reduce pain and swelling: RICE (Rest, Ice, Compression, Elevation). Longer term rehabilitation to restore mobility and stability: Wobble boards, ankle supports and braces. Exercises help the ankle return to full strength. Professional treatment may include anti-inflammatory medication, taping or ultrasound / laser treatment. Massage of the ankle (after acute phase has passed) to break down scar tissue and promote healing. Softening of the tissues that may be restricting movement. A condition resulting in pain under the heel, radiating into the foot. The plantar fascia is a broad, thick band of connective tissue under the foot which can become inflamed. Pain is worse first thing in the morning but eases, only to gradually only get worse later in the day. Common in sports which involve running or jumping. Sportspeople who overpronate are at risk as the biomechanics of the foot pronating causes stretching of the fascia. Very tight calf muscles produce repetitive over-stretching of the plantar fascia leading to inflammation and thickening. As the fascia thickens it looses flexibility and strength. Footwear which does not provide adequate arch support has been attributed. Footwear for plantar fasciitis – both prevention and treatment – should be flat, lace-up and with good arch support and cushioning. Overweight individuals are more at risk of the condition due to excess weight impacting on the foot. Pain under the heel, usually on the inside. There can be pain when pressing on the inside of the heel and sometimes along the arch. The pain is usually worse first thing in the morning as the fascia tightens up overnight, and after a few minutes it eases as the foot gets warmed up. As the condition becomes more severe the pain can get worse throughout the day if activity continues. Heel pain at the origin of the arch ligament when weight is put on the foot or if standing on tip toes, tenderness and swelling under the heel, numbness along the outside of the sole of the foot. Stretching the plantar fascia may be painful and sometimes there may also be pain along the outside border of the heel. Rest: walking on the painful foot aggravates the injury and increases inflammation. Taping techniques can help support the foot relieving pain and helping it rest. Cold therapy to help reduce pain and inflammation. Exercises in particular stretching the fascia. Anti-inflammatory medication such as ibuprofen. Visit physiotherapist to perform gait analysis to determine overpronation or oversupination and prescribe orthotics or insoles. An insole can restore normal foot biomechanics if overpronation is a problem. Massage of the feet and lower limbs to reduce tension and stretch the calf muscles. Advice on suitable footwear with appropriate cushioning, arch support and orthotics. Advice on exercises. The back is placed under strain when jumping, bending and twisting. Acute back pain comes on suddenly and is often caused by a movement such as bending over. The pain is usually in the lumbar area. Longer term (chronic) back pain is usually caused by an initial injury but over time muscles tighten up in response which makes it worse. Stiffness and aching pain may be constant or come and go, on either side, both sides or in the middle. A common complaint is that the pain is in a band all the way across the lower back. Reduced mobility in one or more areas of the back and muscle spasms in lower back and buttocks may be present. Core stability exercises to strengthen the core, protect the lower back and prevent injury occurring. Acute pain: get into a position of least pain, whether on front, side or back. Avoid situations that make the pain worse. Rest may help but movement is desirable after the initial pain and inflammation has gone. Mild or moderate pain (chronic / long term): heat – for example, hot bath or hot water bottle placed on affected area. Regular exercise keeps back strong and healthy. Back massage can help treat and prevent lower back pain, help to increase flexibility and strength, and restore full range of movement, accelerate healing and encourage tissue repair. Identification of poor posture while standing or sitting, and advice on correcting this. Suggestion of simple changes to lifestyle ie good desk chair with lumbar support, lifting techniques, mattress. Stretching advice.